"Rooster VI", 8" x 8" Oil on canvas panel. I'm back! I took a wonderful two week vacation (but stayed home) and had a great time with my boys. We celebrated the holidays, saw tons of movies and spent a lot of wonderful time with family. I even read two books. I guess you could say I did everything but paint! I have put together my "art goals" for 2010 and I would love your input! 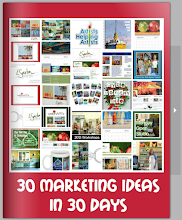 Develop a comprehensive art marketing plan for 2010. Continue to update my blog regularly and post at least four paintings per week. Form an Art Alliance with a small group of artists that want to develop marketing ideas, schedule a group show and share exhibition ideas. Create a year long jury/exhibition schedule. And follow it daily! Continue taking classes and workshops from artists I admire. 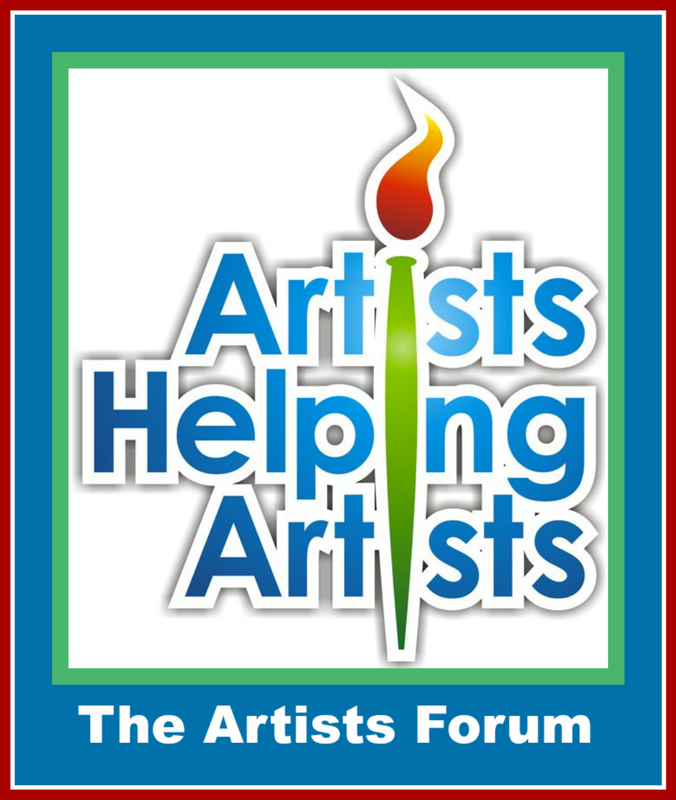 Write at least 10 articles for Art Forums or blogs. Send 12 newsletters out this year and continue to share the talents of other artists in my newsletter. 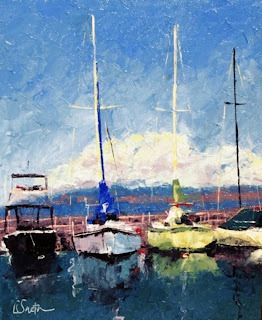 Develop and teach one palette knife painting workshop. Paint plein air AT LEAST twice monthly. Pursue ways to sell my art to the corporate market. Send my work into TEN juried shows. Develop a “client appreciation” program for the year. Exhibit my work in two galleries or “one person venues”. Accept and complete at least five commissions. Sell 25% more paintings than in 2009. Book another solo show at Gale’s Restaurant in Pasadena. Attend at least one plein air workshop. 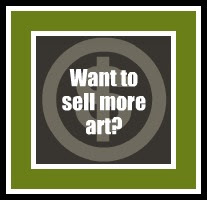 Sell at one of the local shows or festivals - including Sierra Madre, Pasadena ArtWalk, Montrose Art Walk and some new venues. Here's to a great New Year. Thank you everyone for all of your wonderful support and guidance in 2009. God bless everyone! Oil, 6" x 6" on canvas panel. I took a well deserved break from the kitchen today and painted this little one, while enjoying Christmas carols playing loudly in the background! I absolutely love this time of year (but not the week before our party) and the short break was a good reminder to stop and enjoy the season! My oldest just finished his last final for his first quarter in college and I remember that feeling ... maybe I will feel a little bit of that on Sunday morning? I hope so! Time to Sail (and cook)! You all know I am just swamped cooking and getting ready for our annual holiday party (which is this Saturday night). A few of you emailed me and asked if I would print the menu. I do cook everything but I also have a crew that comes in on Saturday night and cooks everything I have made (so I can enjoy the party). I guess you could say this is my holiday gift to all of our family and friends. So, if you don't see any more new paintings on my blog this week ... you now know why! "One Cat on the Beach"
If I survive this week it will be a miracle. Our party is on Saturday night and as I mentioned before I am cooking for 150 people. Today I was hanging a garland in our house and somehow I managed to fall off the ladder and fall and chip my tooth. So tomorrow I will need to spend a few hours at the dentist getting it repaired ... which is time that should be spent cooking! At least I don't have a fat lip or any other major injuries. So I guess that is good news. I did manage to paint two little ones today. I have five commissions that will all be done next week. Then I will have to think about starting my holiday shopping! Yikes! TGIF. I think. It's been one of those weeks. I have a ton of paintings to finish and I am still cooking for our party next weekend. Did I mention we expect about 170 people and I am making all of the food? We have done this party for 24 years and we keep making (and thus inviting) more friends! And I have to cook the food ... otherwise I think my friends would kill me! So ... here's to a weekend of spending time in the studio and kitchen! Wait ... do you think I could cook and paint at the same time? Never mind ... probably not a good idea to poison our guests. Oil, 6" x 8" on canvas panel. I bought a new mac laptop last month and have been making lots of trips to the Apple store for training. My only concern about switching from a PC was that I was going to have to rebuild my website. After struggling with the Microsoft Frontpage program for many years, the new iweb program is simple to use and wonderful! So, I launched my new website today. 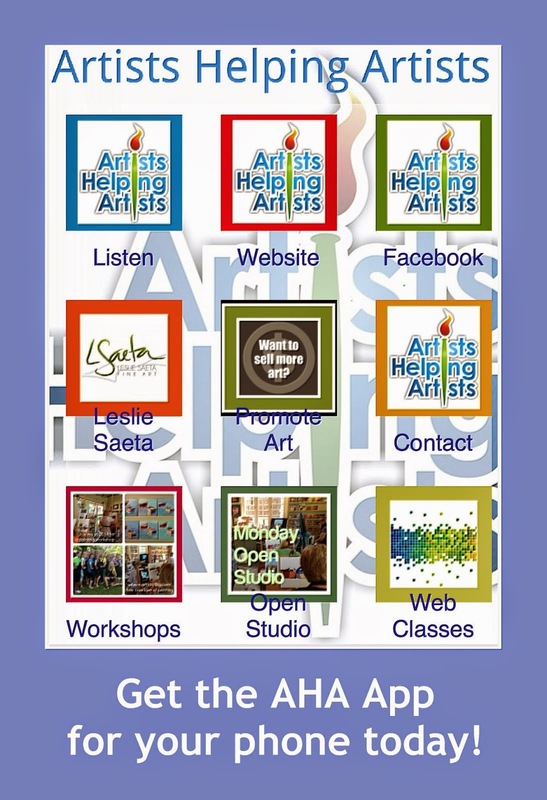 Take a look at www.saetastudio.com and let me know what you think! "Sailing Under the Golden Gate Bridge"
One of my favorite cities in the world is San Francisco. I lived in the Bay Area for about five years after I graduated from college. In fact, I met my wonderful husband while I was living in Palo Alto. Last year I took a weekend trip to San Francisco with my girlfriends and we played "tourist" for the weekend. It was so fun to see the city again and all of it's beauty! Now that I have a son in college in Palo Alto I need to try to make lots of trip to Northern California. I had so many emails about a painting I finished last month similar to this one that I thought I would give a similar one a try. I am happy with the outcome as I love the colors. If I could paint with orange in every one of my paintings I would! I painted a painting similar to this one a few months back and had a request to paint another one similar to it for a Christmas gift. I changed the colors and the format a bit and I like this one just as much as the first one! Thanks for so many wonderful comments about my story on my blog post from yesterday. Isn't it wonderful in life when miracles happen? You have got to love the name of this painting. It so clearly describes my day today. In fact it is a miracle that I actually finished a painting today ... it was just a wonderful day. The highlight of my day was taking my son to visit his dear friend Jackson. He was injured in a football game on Halloween (as you may remember from my previous post). These past few weeks have been so scary ... brain surgery, weeks of intensive care, and his inability to speak and move his right side. And yet today ... only four weeks later ... I sat today in his hospital room as he laughed, talked and enjoyed a visit from six of his football teammates. For weeks we have all been watching and praying that he would gain movement to his right side. And sure enough, earlier this week we were visiting Jackson when he returned from rehab and moved both his right leg and arm for the first time. I cried (of course) and will always cherish that moment. Watching the pride in Jackson's face as he showed his mom and dad that he could finally move his right leg and arm is a moment I will always remember. Today Jackson was talking, laughing and enjoying the afternoon visit. With rehab we now all believe that he might make a full recovery. Mentally, he remembers everything ... (including the football game). In fact, my son participated with Jackson in some of his rehab exercises and proudly announced that Jackson was beating him in many of the skill tests! I think I was so happy and content after our visit with Jackson that any chance of being productive today was unlikely. So, we finished off the day watching football. Today may have been a lazy Saturday afternoon but it was one that I will cherish forever. I have been busy getting ready for the holidays and finishing commissions. This is my favorite time of the year and our oldest son comes home from college this evening. I am so thrilled! So here's to five long days of family, great food, football and painting! Oil, 8" x 6" on canvas panel. I heard earlier today that Whistler already has 100 inches of snow this year ... and they are expecting 100 more inches later this week. I think this is a good sign for the Winter Olympics which start in February 2010. All of the skiing events will be held in Whistler. I have visited this charming town about ten times, but have only been there in the "cold" wintertime. It is one of my favorite cities! Enjoy! Oil, 10" x 8" on canvas panel. I was out all day ... watching my oldest swim in his meet, watching my youngest play in his volleyball tournament (with my husband as his coach), having a blast in Long Beach with my middle son and his girlfriend ... and agonizing over the outcome of the Stanford vs. Cal. football game. I did get to spend about an hour taking photos of boats in the marina in Long Beach. And wow ... I really got some stunning shots! So look more boat paintings! And beach paintings! "Sailing Past the Marina II"
I have been driving back and forth to Long Beach for the past few days as my son's swim team is in So. Cal. competing in a meet. It is so great to see him ... although our time together consists of watching him compete from the stands and then waiting outside for a quick hug and hello after the meet. I think we are averaging about three minutes a day. But hey, I am not picky .... I am thankful for any time I am able to see my college son! So between prelims and finals (and lots of time spent on the 710 freeway) I finished this painting today. Enjoy. "Waiting For a Boys Weekend"
So ... if you read yesterday's post you will know that I have been accused of painting "girl" boats (all in fun, of course!). Apparently my choice of colors mostly includes reds, pinks, oranges ... you know ... "girl" colors. So I promised that today I would try to paint with "boy colors". Ok, so I tried. The colors on my palette today were ultramarine blue, sap green, yellow, titanium white and cad red. Although there is no red in this painting, I did need to use a tad bit in the mixing (red and green makes brown ...). So, the end result is a painting with lots of brown, blue and yellow. Would you say these qualify as "boy" colors? I will put this one out tonight and see if all of the boys in my house like it! I spent all morning shipping paintings and thus I did not spend all day in my studio like I had intended. At least I was able to finish this little painting. A few days ago there was a humorous post on my blog that I always paint "girl boats". As much as I like to use color, it was brought to my attention that I use a lot of pinks, reds and oranges ... also known as "girl colors". So, when I started on this painting this afternoon, I decided to make a conscience effort to paint a "boy boat" painting. So, I mixed all blues and greens and yellows. A while later I looked at my painting and I think I actually painted yet another "girl boat" painting. It is obvious that I like bright colors (and I live in a house with three sons and my husband so our house lacks "girl colors") so tomorrow I promise ... I will paint a "boy boat painting" with browns and dark colors. Well ... maybe just a tint of orange ... Stay tuned! I haven't posted on my blog in a few days as life has been crazy around here. This weekend was all about sports ... CIF playoff games, the Stanford vs. USC football game, volleyball tournament to name a few. The highlight was certainly our afternoon at the coliseum as we bravely wore our Stanford gear among 90,000 USC fans. For those of you that were hiding in a closet this weekend and didn't hear about the game ... it was amazing and Stanford won ... by a lot! I did have a chance to take my youngest son to visit his dear friend Jackson who suffered a football accident on Halloween. He was moved out of ICU and his family thought that a visit from a close friend might be a good idea. It was a touching and emotional experience and I am so thankful that Jackson is making progress everyday. Michael is determined to try to "make things all better" and last night he was surfing the internet looking for more information and ways to help his friend. I am not sure a 15 year old can find solutions (more so than a neurosurgeon?) but I do think his two visits this weekend brought a smile to Jackson's face. Please keep Jackson in your prayers. This week I need to finish a few commissions and paint more as I sold five paintings last week and I need to build up my inventory. After I finish the commissions I will start painting gifts for my family for Christmas! I think that is nine paintings ... yikes! I am off to my studio! Oil, 6" x 6", Oil on canvas panel. It seems like it has been forever since I painted boats. So I thought it might make sense for me to get back to painting a few boat scenes! It feels so good for me to be back at the marina again! "Heard it Through the Grapevine"
I painted this little one at the end of the first day of the plein air weekend. I had about an hour and a half until the reception and I felt like I should find something to paint. So I got in my car and drove down by the vineyard and sat on the back bumper and painted this view of the grapevines. The next hour made me very aware of how comfortable I am when I paint in my studio. I don't mean to complain but I can tell you that I was laughing out loud when I finally finished my painting. All I did was think of a fellow painter Marc Hansen who paints plein air every day. He lives in Minnesota and goes out to paint in temperatures that freeze his fingers, his entire body and yes ... his paint. All I needed was a quick reminder of how he paints outdoors all winter long and I knew that I really was lucky ... and warm! I couldn't resist painting this as the sunlight reflecting on the side of the Art Gallery building was amazing. One of the other artists set up behind me and painted the same painting. He had so many nice things to say about my painting and was astounded with my willingness to use so much paint! Gotta love the palette knife! Oil, 8" x 10" on canvas panel. I spent the weekend at a wonderful plein air painting event at Falkner Winery that was hosted by Segil Fine Art Gallery and the Pasadena Art Gallery Association. It was wonderful, especially because I was also able to spend the weekend with my parents. I met some wonderful artists and gallery owners and the scenery was very fun to paint. I don't get out to do these events very often but I am definitely going to add this to my goals for 2010! I really need to get out more often. Good news to share! I found out today that three of my paintings were juried in to the Segil Fine Art Gallery 2009 Holiday Small Works Show. Exhibition dates are December 5 through December 31, 2009, and there is an artists' wine and hors d’ouvres reception, Saturday, December 5, 5-7pm. I found out that some of my favorite artists friends are also in the show ... Julie Hill and Marian Fortunati. I am so honored to be in this show with them! For more info. go to http://www.segilfineart.com/. I am heading to Temecula tomorrow for a wonderful painting weekend. I finished this painting this week as we are allowed to bring one completed painting for the show. I think it fits the theme! One of my favorite galleries, Segil Fine Art (in conjunction with the Pasadena Art Gallery Association) is hosting the Second Annual Fine Art Invitational at Falkner Winery. This year's event will be from 10am - 4pm on Saturday, November 7 and Sunday, November 8; coinciding with the winery's Annual Fall Barrel Tasting Festival. Please join me for this spectacular two day event with over 30 plein air artists painting the beautiful Temecula wine country. For more information on Falkner Winery and directions go to www.falknerwinery.com. "Two Cats on the Beach"
I am posting this painting I finished awhile ago because I lost the charger to my camera and the battery has died. I also just got a new laptop and have not transferred data so I am using two computers at the moment. I have decided to go with a mac and I love it ... I can't believe I have waited so long to "cross over to the other side". Plus I am taking advantage of the free mac classes and they are wonderful!!! So, I will post a new painting tomorrow as soon as I buy a new charger for my camera! "Reflections All in a Row"
I spent all morning and afternoon painting in my studio. At about 2:00 I went outside to take a picture of my painting and was stunned ... it was 92 degrees. I had no idea! Our house is 94 years old and the old plaster walls serve as a great insulator from the heat. Somehow I had imagined it was a 70ish degree day and I was a bit sad that I had missed an entire lovely and warm day! Weather aside, I like this painting. The reflections were really fun to paint. I also worked on a wine themed painting that I am going to try to finish tonight. I have lots to do and I am really motivated to finish all of these paintings! I will be in Temecula this weekend for the plein air paint out at Faulkner Winery. Should be fun ... although I hope the weather cools down a bit! Today is one of those days where all I want to do is hug my kids. This past weekend a terrible accident happened on the football field as our high school was playing in a game against a school in Palos Verdes. One of my son's closest friends was knocked unconscious on the field and stopped breathing. Fortunately there were two doctors in the stands that were able to keep him alive as an entire stunned group of players, fans, parents and coaches waited for an ambulance. Sadly, he suffered a blood clot in his brain. He quickly underwent a very elaborate but successful surgery. Although he is critical we are all praying for a full recovery. I can see the pain in my boys faces as they wander around the house, searching for an explanation of "why" and "how could this happen". I tear up every time I think of his parents and siblings as I can't even imagine what they are going through. Of course I can't stop thinking how much I hate the fact that a beautiful teenage boy can be fine one day and in a life threatening situation the next. As a mother of three boys who are very serious about their sports, I can't imagine what I would do if anything like this happened to one of my own. So ... say a prayer. And please, hug your kids today. I thought it might make sense to try a boat painting with some lights ... for those of you that haven't seen the Newport Beach Christmas boat parade ... it is really fun and quite festive! So, even though this boat probably does not have enough lights to compete with the other decorated boats in the parade ... you can get the idea here. And oh yeah ... Happy almost Halloween! I need to paint some holiday paintings to get ready for client Christmas cards, gifts, etc. so I thought this might be a good start ... of course now all I want to do is turn on Christmas music and start baking! Perhaps I should have tried a Halloween painting first! But at least I am starting these early so I will have time to print cards, gift tags and all of my other fun ideas for the holidays ... watch for more to come! I have been out of town for almost two weeks ... I spent over a week in Hawaii for business and three days up in northern California visiting our freshman son in college. I am exhausted but so happy to be home again! Now it is time to get back to my studio. Sorry that I have been posting so little but I find it hard to paint when I am on the road! New paintings tomorrow, I promise! Oil, 6" x 6", on canvas panel. This is my last full day in Maui. I head home tomorrow and then off to Northern California to visit our "college Student". I am so excited!!! While I have been in Maui I have been able to take an early morning power walk along the beach in Wailea. I love my morning ritual and thought it might make sense to paint my morning view! "The Pool at the Grand Wailea"
6" x 6" on canvas panel. Maui is great. The weather is beautiful and I found about one hundred things to paint on my power walk this morning. Things are busy so all work and no play but that is ok. I love my client! Only one wish for today ... go Dodgers! I am in Maui! Yippee! I am heading to Maui in the morning for a week. And for the record, this is business. For most of my adult life I have worked full time as a corporate event planner and I have an incentive group of 200 people that I am responsible for next week. Amazingly enough, I have been working with this client for 20 years! I am bringing my paints with hope that I can get an hour away here and there to do some painting. Keep your fingers crossed that I will be able to paint in Maui! "The Church at the Grand Wailea"
First off, I have to apologize for the quality of this picture. It has been raining in LA all day today and I still haven't figured out how to take a photo indoors that looks half decent. But since it rains only about two days a year here, I think this is a short term problem. For those of you that have been to the Grand Wailea on Maui, you will recognize this adorable church! I will be there in a few short days. Mahalo. This past weekend was simply amazing. It was all about art and I loved it! The weekend started out with the Pasadena ARTWalk and it was a great show. 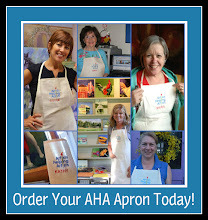 The positive feedback I received was overwhelming and the sales were great. One of the paintings I sold was "Castle Green". It turns out three people wanted to buy it. I think I am going to try to paint more urban scenes ... maybe less boats? After spending all day at the ARTWalk, we participated in the South Pasadena Preservation Society House tour. Actually ... our "house" participated. It was one of the homes on the tour. Saturday night we hosted 120 people as part of a progressive dinner and Sunday we opened the house (all three floors) to tours. I made some wonderful new friends and I think met some new fans of my artwork. And yes, my house is so clean ... I am ready for the holidays and it is only October! We also attended the California Art Club opening on Saturday night of the exhibit "City of Trees" in which my painting "Library in Bloom" is on display. We could only stay a short time but it was amazing to see my painting hang amongst so many other wonderful paintings. What a fun night! One of the things that came up many times this weekend is whether I would consider teaching a palette knife workshop. It sounds very interesting but I am just not sure if it makes sense. Anyway, I practiced teaching my youngest son and here is his first painting. I did help him and re-work it, but his first attempt at painting with a palette knife is amazing! 6" x 6", oil on canvas panel. 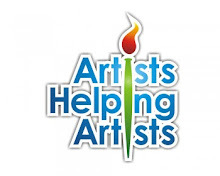 You Too Can be a Famous Artist! Today's post will address how important it is to have a website for your art. I was driving out to the Women Painters Luncheon today and had a lovely conversation on the phone with my younger sister. (She lives in Virginia and we don't get to spend enough time together!) She shared with me a very adorable story. Her daughter, Erin (age 11) has to do a report on a "famous artist" and apparently she has selected me as her subject. Now, I know my newly developed art career is going well, but I do not think that I can be considered "famous" in the art world ... or even her middle school art class! Of course, when Erin explained to her teacher that she wanted to use me as her subject for the "famous artist" report, her teacher questioned just how famous I was. So naturally ... my niece insisted that they take a look at my website. They pulled up my site (right there in the classroom) and ... her teacher decided my art looked good and approved the selection! Yippee! You might recall that Erin's art was featured on my blog back in August as I spent an afternoon painting with my nieces and nephew while we were at our family reunion. Go to http://lesliesaeta.blogspot.com/2009/08/lake-oconee-house.html to see their adorable art! I am still painting east coast boat scenes. The weather has finally cooled off in Southern California so perhaps that has me in this funny painting mood. But I like this one ... click on it for more detail. I will be painting and working on commissions tonight ... while cheering the Dodgers in the playoffs. Go Blue! I thought it would be fun to try to paint some East Coast destinations this week. And I like the way the colors came out in this one. Oil, 10" x 8"on canvas panel. I had fun painting this one today. I have used this reference photo probably ten times for paintings and I love how they all look so different! This photo is taken in Lahaina Harbor in Maui. I am heading there next week for a week long business trip and I look forward to getting more great photos! I received some great news over the weekend. My painting titled "Library in Bloom" posted in my last post was juried into the California Art Club exhibition "South Pasadena: City of Trees". 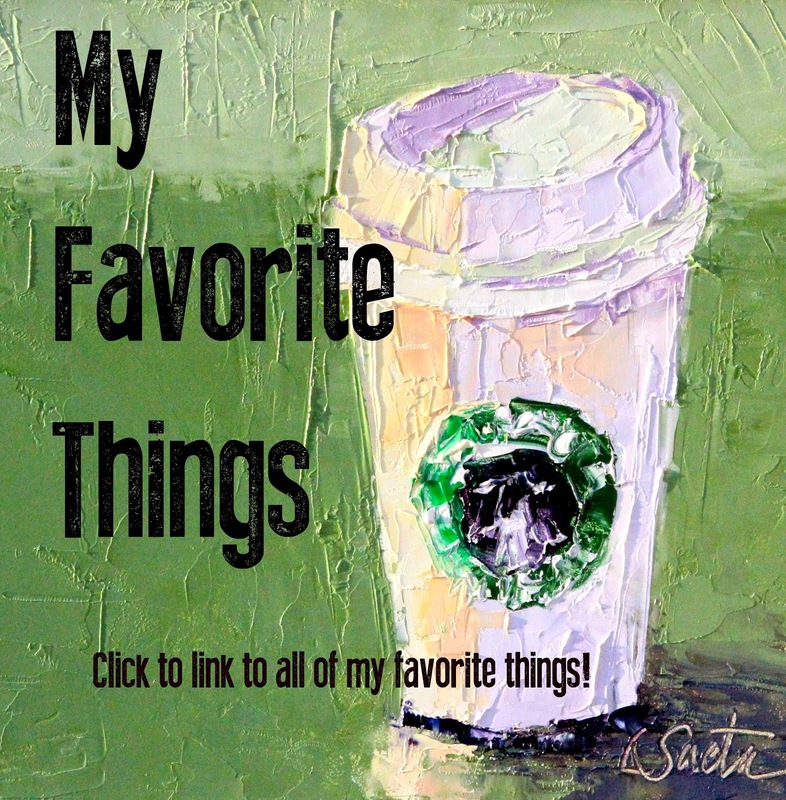 I was thrilled to learn that my blogging friend Marian Fortunati also had a painting selected. We had lunch after I dropped off my painting and we both lamented that the art was so good and we didn't have a chance. Thank goodness we weren't judging! I just finished this painting for the California Art Club "South Pasadena - City of Trees" competition and show. It is not often that I get to show off my hometown and the beautiful trees that are found everywhere in South Pasadena. There is a full weekend of art events scheduled this weekend in South Pasadena so click here for more information. Don't forget I will be participating at the ARTWalk in Pasadena next Saturday, October 10th. Click here for a great article about the event! I do need to thank Laurie Allee for the inspiration for this painting. She has a wonderful blog titled Glimpses of South Pasadena. Be sure to check out her amazing photos! I was asked by a friend if I would donate a painting for the upcoming Rose Bowl Aquatics Water Polo fundraiser and auction. Although I am not involved with the organization, my boys do play water polo and I am a huge fan of the sport. Of course it would have been easy to just donate one of my "boat paintings" but I thought I should try to paint something that might be more appropriate for water polo families. So as I was sitting at my boys water polo game yesterday afternoon I decided I needed to come up with something fun. This was a quick one ... because I am TOO BUSY WITH COMMISSIONS ... but I really had fun painting it. Originally I painted the hand in the shadow but it was way too dark. So I redid it this morning. And I had no idea that hands were so hard to paint! Yikes! 12" x 12" on canvas panel. I recently found out that I was awarded second place for my painting "Castle Green" in the Pasadena Playhouse District ARTWalk competition. The ARTWalk is next Saturday, October 10th from 11:00am - 5:00pm. I will be in booth #29 and will have 25 works on display. The ARTWalk will be located on El Molino just south of Colorado Blvd. If you are in town, please stop by! The ARTWalk will always be special to me. Last year I entered and won Honorable Mention for my painting titled "Any Day But New Years". That show was my first art show! I remember how nervous I was and shocked that I had won a prize. I think that show gave me the confidence to keep painting ... and to sell my artwork! I know I spent a lot of time on my blog yesterday reminiscing about this past year and how much I have enjoyed my new "art passion". Art is such an amazing part of my life now and even on the bad days (when my paintings are awful ...) I still love it! I must be in some kind of a nesting phase because I have spent a lot of time this past week organizing my studio, frames, cabinets ... just about everything. This past year I have printed note cards of my artwork and last night I discovered I actually have 37 different paintings on note cards. Maybe I should stop for a while (although I order them for free on www.vistaprint.com and just pay for shipping)! A bit excessive I am afraid! But I am happily re-organized and I even filed all of my inspiration photos by category (yes ... I admit that I am an "A" type personality). The boys will be on school trips next week so I do hope I can bury myself in my studio and produce a lot of paintings while they are gone. I went and saw the movie "Julie and Julia" today. I read the book five years ago and I remember at the time thinking to myself "what is a blog?". I feel a bit like the character Julie in the movie when I think of how much my life has changed this year. And it is really due in large part to my blog. When I sat down last December and created my blog "Painting is my Passion" I did it because I wanted to paint more. I decided to create a blog to make myself paint (and post) at least five paintings a week. When you consider that in 2008 I had only painted a total of 25 paintings, this was a pretty lofty goal. But I felt like I needed to try something radical to see if I should take my art more seriously. Here I am ten months later. And my how things have changed! I have posted 157 paintings on my blog and sold 61 paintings so far this year. I even send out a monthly newsletter to 527 contacts, many of whom I still had never met. How odd to think that none of this would have happened had it not been for my blog! So thank you to all of you who have encouraged me, said nice things about even my paintings that weren't that great (oh yes, I know which ones those are) and of course, thanks to those of you who have purchased my paintings. What a difference this year has made! I am now officially what one might call "an artist"! Thanks to you! I need to finish five Hawaii paintings by mid October and this is only the first. I love the colors, although it doesn't look like my photo came out that well. It looks much better in person! Maybe I will try to take another one. I was lucky enough to be awarded the Kreativ Blogger award by Bobbi Heath. I am really touched that she passed on this award! You can find her blog here. 1. I am crazy when it comes to multi-tasking. My latest trick? I listen to books on tape while I oil paint. 2. I am 5'11" tall (so that is at least 1/2 the reason why my boys are so tall ...). 3. I have four brothers and sisters. 4. I painted my first oil painting in 2005. 5. I have been in two emergency landings (both on American Airlines). 7. I truly believe I was put on this earth to be a mom. It is by far the best job in the world. 8" x 10", on canvas panel. While we were on our wonderful motor boat ride in Hvar, Croatia we passed a tiny island and saw this adorable "beach club". I was immediately enamored with the three green umbrellas and thought it was funny that no one was there! Perhaps we should have stopped and spent the day there! I am still having fun painting pictures from our trip to Europe. Croatia was such a magical place. Unfortunately we had a bad experience once we took the tender into Dubrovnik. On the day we were there ... two other ships were also in port that each held 3000 passengers. So the town was ridiculously crowded and the heat was at least 95 degrees! But the little bay had some beautiful boats and I was able to capture this photo. It sure looks a lot more peaceful in my photo! Our favorite sight heading back to the ship was a water polo court in the ocean ... we even saw a team practicing. It seems as if I have been on the road forever ... but I am pleased to say that we are now home for a long time! Our oldest is all "tucked away" at college and now I am back in my studio! One of my favorite stops on our cruise was in Hvar, Croatia. It is truly a beautiful spot and I took hundreds of pictures of boats. The water was so blue and clear so we took a small boat ride around the many outside islands. Enjoy!